A well-built website requires expert attention to website design, development and your long-term goals. From ensuring that your site generates a high ROI, analyzing calls-to-action and responsive coding for modern browsers and mobile devices, we build websites that are built to support your mission and increase your sales. While there are many DIY website options available at a low cost, these programs often miss the mark on important elements of Google rankings, usability and mobile responsiveness. With a site that doesn’t rank well or doesn’t perform well for all users, you risk wasting your money and lost profit. We understand that these DIY options are attractive because many small businesses or individuals find the low monthly cost attractive, though they will be handling the bulk of the work. That’s why we have implemented payment options that allow our small business clients to get the website they need, by offering a lower monthly payment; a “Lease-to-Own” option. Our standard payment terms require a deposit of 50% of total cost of project and the remaining 50% to be paid as development hours are expended and prior to website launch. While this option works well for many clients, we understand that there are exceptions and some clients are more comfortable making smaller regular payments. That’s why we now offer our “lease-to-own” website payment plans on projects under $10,000. 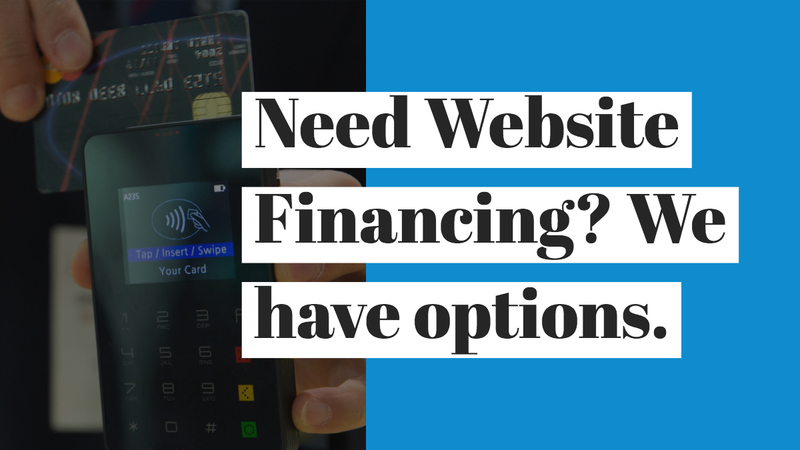 With our 12-month Lease-to-Own payment plan for your new website, you will pay 10% of the total project cost monthly for 12 months as a website “leasing” fee. At the end of the 12th payment/month, you will retain 100% ownership of your website. Example: A website costing $5,000 would be $500/month for 12 months. For more information, contact us or get a quote now. With our 24-month Lease-to-Own website payment plan, you will pay 6% of the total project cost monthly for 24 months as a website “leasing” fee. At the end of the 24th payment/month, you will retain 100% ownership of your website. Example: A website costing $5,000 would be $300/month for 24 months. One of the fastest growing, non-bank business loan companies, OnDeck serves more than 80,000 businesses across 700 industries in the US, Canada and Australia. Qualified small and medium sized businesses can receive up to $500,000 in as little as one business day to help finance their website development project. Additionally, their process stands out because it allows the business to build business credit. OnDeck is a publicly traded company on the New York Stock Exchange (NYSE:ONDK). With over $8 billion in loans delivered to date, and an A+ rating with the Better Business Bureau, OnDeck is changing the way that small businesses get financing. To explore the small business loan options that OnDeck offers, visit them at OnDeck.com. We look forward to helping you build your new website. Feel free to give us a call 888-482-3666 or email us to learn more about how we can help you.